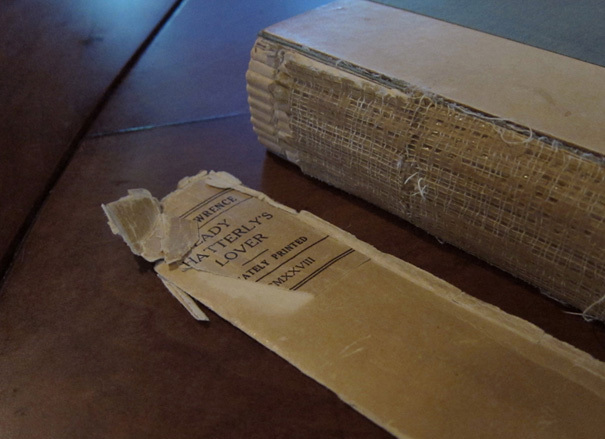 This is Wharton Esherick's own copy of "Lady Chatterley's Lover", photographed at The Wharton Esherick Museum in Paoli, Pennsylvania. (Photo: Andy Beach). Read more: "Wharton Esherick: Journey of a Creative Mind" by Mansfield "Bob" Bascom. Due to the explicit nature of some of the scenes in his story, D.H. Lawrence was unable to find a publisher for his novel Lady Chatterley’s Lover. So he went to Florence and paid for a private printing of the book, designing the book himself on location at the Tipografia Giuntina. Only 1000 copies were printed, each of which were signed by the author. The plain, unprinted dustjacket made it somewhat easier to smuggle copies of the book past customs officials in the United States. When that didn’t work, the Centaur Book Shop’s proprietor, Harold Mason, arranged for the shipment of a case of books with the spines removed and replaced with those from a book of the same size.